Portable generator accessories are essential components that ensure that your generator is functioning properly. Without these components, the operation of your generator gets crippled, and this leaves you without emergency backup power for your home, construction site or the primary power supply for your RV. Here are 10 of the most used portable generator accessories that you will definitely need at some point, to use your generator optimally. This is an electrical switch that transfers the load between the generator, and the main utility power in the event of a power outage. Usually connected to the electrical panel in your home or RV; and when the main power fails, the portable generator carries the load and upon resumption of the main utility, it transfers the load back to the main supply. It functions manually. You physically have to flip a switch when there is a power outage to transfer the load to the generator, and when normal power resumes, you have to put the switch off as well. It automatically transfers the load to either the mains, or generator power supply as needed. It can be programmed to carry specific loads depending on your immediate power needs, and the size of the generator. We’d recommend having a professional install the transfer switch for you. This way you can be sure that the connections are correct, and you avoid any fatalities that may arise as a result of poor connections. For a complete whole house power check our whole house generator reviews. 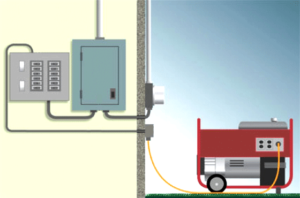 Extension cords ensure proper delivery of electricity from the generator. You, therefore, require heavy-duty extension cords for the various appliances that you intend to power up with the portable generator. Power cords are rated in amps, and the power cord that you buy should correspond to amp specification of your generator’s outlet. The cord should be of suitable length for added convenience. Most generators have mufflers installed to make them work as quietly as possible, but sometimes this is not enough. Especially at noise enforced camping sites, knowing more about the noise-level is important. To reduce the noise even further, you can invest in a quiet muffler and install it on your generator. Pick a muffler that fits your generator for the best noise reduction capability. In this case, you can also think of upgrading to a quieter generator or an inverter generator. 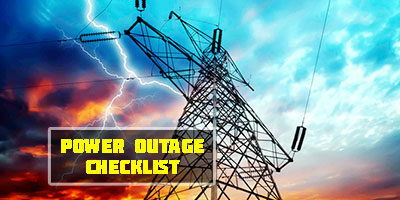 This is particularly important if you have sensitive appliances to power up. An AVR maintains the generator’s voltage at a stable state for effective usage with delicate electronics. A fuel stabilizer is particularly important if you intend to store your portable generator for some time with oil in it. It keeps the fuel fresh and prevents gum buildup. This way you don’t have to drain the fuel before storage. Several air filters to replace old dirty ones. This ensures proper air circulation for optimal generator operation. Spark plugs in a generator wear out with time. A maintenance kit contains new spark plugs to replace old ones. The oil in the maintenance kit is for changing the used-up oil. If you live in an area with cold weather, then you ought to have a cold weather kit. This kit includes an oil heater, and a battery warmer. A battery warmer, placed below the generator’s battery to heat it up when the temperature gets too low. The oil heater is in the form of a crankcase like heater, that just heats the oil to prohibit solidifying. Wheels are great accessories for your generator. If your generator lacks wheels and is heavy, then you’ll need to fix a wheel kit to make it portable. Non-flat wheels are the best as they are easy to maintain. A generator could get damaged when it is left exposed without a proper cover. Always cover the generator with a suitable cover to protect it from the elements when it is not in use. A good generator cover is weatherproof, and this ensures that the generator is forever dry and free of dirt, dust, and rust. Make sure that the cover you acquire matches the size of your generator for proper protection. Sometimes you want the convenience of being able to run your generator without having to physically walk to its location. In this case, you need a remote start. A remote start allows you to initiate the generator from the comfort of your seat with the push of a button. A remote start comes as a wireless remote or a remote connected by a long cable from the generator.